Just this past Saturday, we honored Our Lady on the Feast of Mount Carmel. At first glance, we may not consider this Feast to be of the same rank as the Assumption or the Immaculate Conception, and on one level, this is true. The Feast of Our Lady of Mount Carmel is not as solemn as these most holy days and it does not touch directly upon the prerogatives of the Most Holy Virgin Mary, but is rather a day meant to help us to invoke her freely and without hesitation, making use of a gift that her Son has allowed her to give to us poor sinners. At the same time, it could be considered a precursor of what hopefully will one day be a solemn celebration of Mary's role as Mediatrix of all Graces, already taught by the ordinary Magisterium of the Church but not as yet proclaimed ex cathedra, by the Holy Father or at an Ecumenical Council. When we consider Our Lady of Mount Carmel, thoughts of Our Lady of the Rosary should not be far behind, for Mary appeared to St. Dominic and St. Simon Stock within a century of each other. Considering the time frame, this certainly is not a coincidence. For those of you who are familiar with the writings of Plinio Correa de Oliveira, I would like to briefly direct you to something that he wrote in his work Revolution and Counter-Revolution. In Chapter III, Correa de Oliveira traces the root of the rise of the Revolution against Christ and His Church to two factors, both originating in the Fall, namely, pride and sensuality. Considering that these two wounds in human nature became increasingly externalized in the 13th and especially during the 14th century, is it any wonder that Our Lady gave us two weapons to combat specifically these two enemies of the soul, the Rosary as a cure for pride and the Brown Scapular as a remedy for sensuality (i.e. lust), during a period of time directly preceding what could be termed the "conquest of concupiscence?" I would say that the Rosary was a cure for pride for three reasons. First, Our Lady conquered heresies through the praying of the Rosary, such as the Albigensian heresy, rampant at the time when Mary appeared to St. Dominic. This is not to mention the humiliation of the Muslims at Lepanto in 1571 in the greatest naval battle of History to date, the odds of the Catholic side winning resembling those of Old Testament wars between the Elect People and their enemies. Second, praying the Rosary forces us to humbly acknowledge that God continues to use His lowly Handmaid to destroy the forces of the devil, and yes, the evil one himself. It is no wonder that Mary said to Lucy at Fatima, "Only Our Lady of the Rosary can help you." Third, it is a cure for the pride of theologians who like to spend long hours pondering over questions of God and write extensive treatises about Him, but who, nevertheless, have need of such a "little" instrument as the Rosary lest they become dry and callous men. I refer to the Brown Scapular as the remedy for sensuality also for three reasons. First, wearing the scapular has always been associated with Consecration to Our Lady, which involved an undying commitment to spiritual and physical chastity. 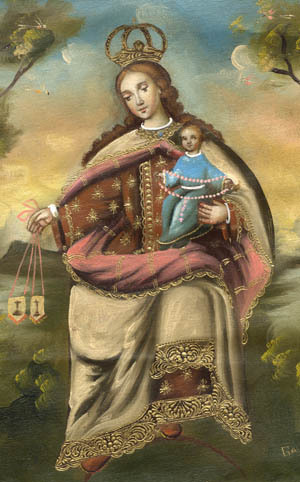 The Carmelite Scapular, it could be said, was the pledge of a pure conscience in the service of the Queen of Heaven, and a reminder of one's bodily commitment to purity whenever he or she should be "tested"
Second, the wearing of the Brown Scapular could be compared, in some way, to the priest wearing his cassock. The cassock is a reminder to the priest of his state in life and it serves as a natural, if not supernatural barrier to sinful thoughts and glances, and beyond. Although the scapular is not as visible as the cassock, it is there and when we undergo temptation, whether or not we give in, it is there as a reminder of our duty to keep us from failing in the expectations of Our Lord and Our Lady for us. If per chance we fail, it helps us to get up immediately, make an act of contrition, say a few Hail Marys, and re-consecrate ourselves to Jesus and Mary. Third, the wearing of the Brown Scapular, especially on hot and sticky days, can also be penitential, thereby serving as a remedy for concupiscence. There are times when we can think of the scapular as a "mini-hair shirt." So, the Rosary and the Brown Scapular, viewed through these lenses, can be seen as complementary gifts from Our Mother to combat two fierce enemies of the soul. The third, following the teaching of St. Ignatius of Loyola, is vanity, a sin deplored by Our Lady at Fatima, when she said that God was already much offended by the fashions of the time. Of course, the fashions of the day were also a result of pride and sensuality, but vanity played a big part as well, especially in the well-to-do people of the day. As I have already mentioned, these weapons of Our Lady did not come a moment too soon and we will only one day know how many souls were saved from the fires of Hell because persons humbly accepted Mary's gifts and made use of them. Now, if only the Holy Father and the Bishops would consecrate Russia to the Sorrowful and Immaculate Heart of Our Lady, how many more millions of souls would be saved as the effects of pride and sensuality, which are raging in the modern world at an unprecedented level, much more than in the days of Noah, as alluded to by Mary to the visionary at Akita, Japan in 1973. These things could be reversed simply by one act of obedience to Our Lady, who always has in mind our best interests, not to mention the Glory of God.